New Liturgical Movement: Who’s Afraid of Pomp and Splendor? 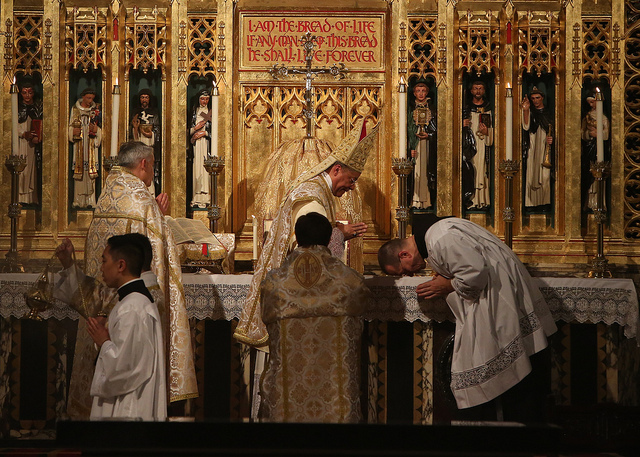 Obviously, not the zealous Catholics who participated in the Sacra Liturgia 2015 conference and its liturgies. According to some left-leaning news reports, the conference was an esoteric gathering of a tiny elite. Interesting. I was there for the whole time and I saw hundreds of people, mostly young and middle-aged, including families with small children who came for the Corpus Christi procession through the streets of Manhattan — the vast majority born after the annus horribilis of 1970. When one looks at photos of more liberal gatherings, one tends to see a disproportionate representation of graybeards and aging hippies, longing nostalgically (one might say) for the good old days. In truth, the Sacra Liturgia conference was a glimpse of the future of the Church. 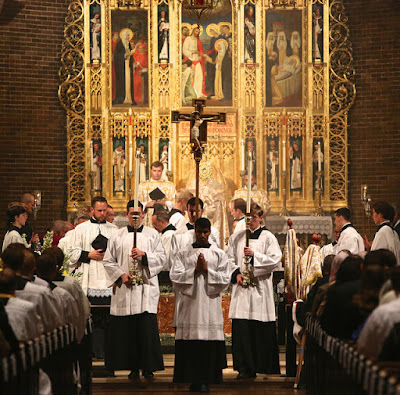 Even as the statistics tell us that bored, uncatechized, unchallenged, and utterly secular faithful are leaving the Church in droves, we see renewal coming from a joyful and serene embrace of the Church’s patrimony of liturgy, doctrine, morality, beauty, and holiness. 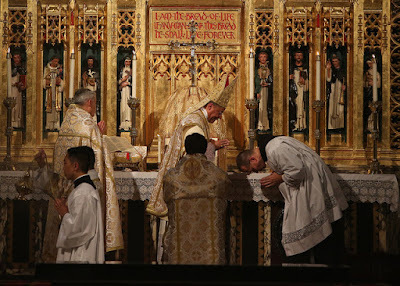 Experience, a good teacher yet seldom heeded, tells us that most of the reforms following in the wake of Vatican II have been a resounding failure; experience is also telling us that the way forward is the recovery of Tradition. Too long and too complicated? Not for this consummate MC! The arts modeled on the supreme exemplar of all beauty which is God Himself, from whom is derived all the beauty to be found in nature, are more securely withdrawn from vulgar concepts and more efficaciously rise towards the ideal, which is the life of all art. And how fruitful of good has been the principle of employing them in the service of divine worship and of offering to the Lord everything that is deemed to be worthy of him, by reason of its richness, its goodness, its elegance of form. This principle has created sacred art, which became and still continues to be the foundation of all profane art. We have recently touched upon this in a special motu proprio [viz., Tra Le Sollecitudini] when speaking of the restoration of the Roman Chant according to the ancient tradition and of sacred music. And the same rules are applicable to the other arts, each in its own sphere, so that what has been said of the Chant may also be said of painting, sculpture, architecture; and towards all these most noble creations of genius the Church has been lavish of inspiration and encouragement. 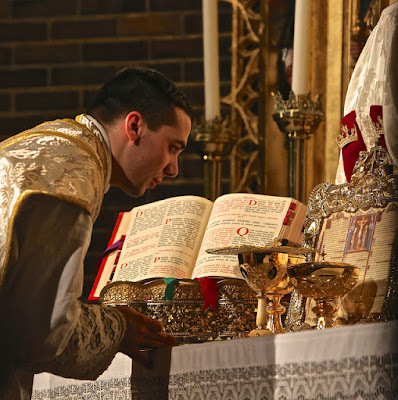 The whole human race, fed on this sublime ideal, raises magnificent temples, and here in the House of God, as in its own house, lifts up its heart to heavenly things in the midst of the treasures of all beautiful art, with the majesty of liturgical ceremony, and to the accompaniment of the sweetest of song. Another archbishop warned of “the new iconoclasts” (p. 282) who wanted to strip the churches of their sacred images. Thanks be to God, sacred images most broadly understood — all the sensible signs that draw our minds and hearts to the transcendent beauty of God, conveying to us something of His divine attributes and powerfully expressing our own acts of faith, hope, and charity — these images were alive and well in the “treasures of all beautiful art” with which we were surrounded in the first week of June in New York City, in the churches of St. Catherine of Siena, St. John Nepomucene, and St. Vincent Ferrer. Laus Deo! Henri de Lubac, Vatican Council Notebooks, vol. 1, trans. Andrew Stefanelli and Anne Englund Nash (San Francisco: Ignatius Press, 2015). Note that de Lubac writes in a blend of Latin (when quoting the council fathers) and French. The French was, of course, translated into English, but the Latin was left intact; English has been supplied in brackets. In the Ignatius Press edition, the Latin is not italicized. 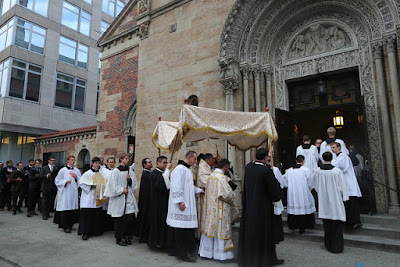 This, in itself, speaks volumes: all of the vestments are, in a certain sense, useless. They are not worn because they are useful; jeans and a T-shirt might suffice if utility were the only criterion. See my article "Maniples, Amices, Cassocks--Lost and Found." 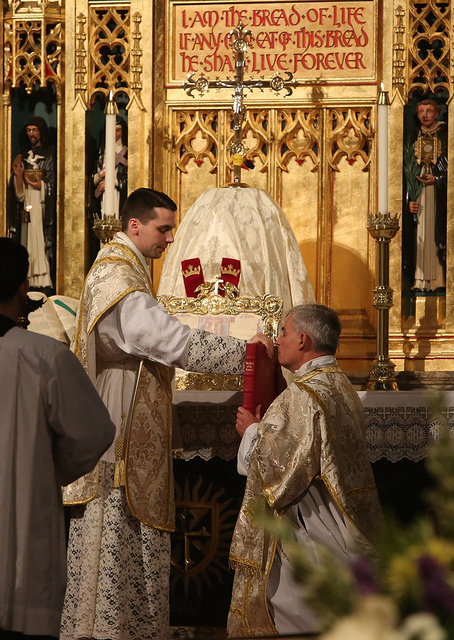 All photos from the Sacra Liturgia Conference in New York City, June 1-4, 2015. Courtesy of Stuart and Jill Chessman/Sacra Liturgia. The complete photo set may be accessed here.